With the Ovens River meandering through the 12 acres of evolving gardens and mature autumn trees, G.G's By The River offer their guests high end, 4.5 star luxury farm stay self contained accomodation. The banks of the Ovens River offers great Fly Fishing opportunities on your doorstep and the perfect place for Matthew to meet you and start your fishing adventure, whether its casting lessons or a days guiding. Merrawarra Minor is a stunning property located in Buffalo River , just a short distance from the home of Matthew Howell Fly Fishing. Tucked away on a working family farm just outside of Myrtleford is a very stylish house with the best views of both the Buffalo and Ovens Valleys. The property boasts acres of beautiful river flats, vineyards, hop gardens and a herd of magnificent Angus cattle , and is 2000 acres in size. It has 7km of river frontage on the Buffalo and Ovens Rivers. 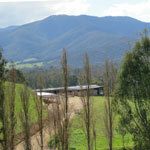 This house is built out over the hill and the cattle can graze right up to the 2 outdoor decks. Mrs Simpson, the cottage at Norala Garden, gives you a unique opportunity to enjoy the renowned gardens built by Miss Norma McGown and Miss Alma Stanhope in the 1960s, and lovingly maintained since then. This beautifully renovated cottage, that magically sits in the ever changing landscape they created, gives you the chance to truly unwind in the historical Norala Garden in the centre of Bright. When you stay in Mrs Simpson at Norala Garden, you have the large and versatile Ovens River running at your back gate. You can literally rig up on the verandah and walk out to catch a good sized trout. It has been done before!